So much done. Yet so much more to do. What could be more anachronistic—in the media culture and political climate of 2006—than the founding of a quarterly journal of ideas?” It was with this question that we launched the first issue of Democracy ten years ago. We sailed against the winds of that time in arguing that in an era when daily short blog posts were coming to define the discourse, there was still a place for a long-form, considered approach to developing new ideas. Today, the 540-word blog posts of 2006 look positively Tolstoyan in an era when even 140-character Tweets are overtaken by the definitional ephemera of Snapchats. Yet, ten years later, the basic beliefs we brought to this endeavor still hold. First, ideas matter. Political positioning and new campaign technologies are empty vessels without something to say. Second, new ideas are needed in a new time if progressives and liberals are to respond to today’s challenges and shape the nation’s future in line with the timeless American values of equality, liberty, opportunity, and community. If anything, these convictions are more true today than they were a decade ago. Democracy was founded in at a time when the conservative movement was both politically ascendant—and intellectually bankrupt. Democracy was founded in at a time when the conservative movement was both politically ascendant—and intellectually bankrupt. With unified control of both ends of Pennsylvania Avenue for the first time in a half century, Republicans had been able to enact their full vision: neoconservative adventurism abroad along with slashed domestic budgets and supply-side tax cuts at home. The results were: Iraq, Katrina, and an economy that first faltered and then collapsed. Our argument, controversial at the time, was that progressives could not simply wait for the political tide to turn or to believe that fine-tuning our “positioning” or “messaging” was enough to reclaim leadership. We believed that in order to gain power and—much more importantly—govern, progressives needed a new agenda. The successes of the 1990s—much less the 1960s or 1930s—could not just be replicated, nor could their programmatic elements simply be cloned. Progressives and liberals needed to focus on what worked in today’s world as well as what problems Americans were facing unique to our time. 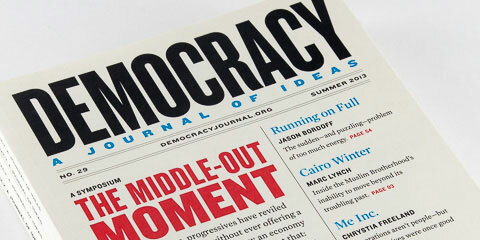 The readers and supporters of Democracy can look back on the past decade with great pride. In nearly a thousand features, book reviews, and other essays, a who’s who of America’s top thinkers have put forward ideas that have had a direct impact on our world. Joseph S. Nye wrote about smart power in our pages back in 2006. In 2007, Shadi Hamid laid out the need to accept moderate Islamist parties as part of our democratization efforts. In 2008, Theda Skocpol and Suzanne Mettler pressed the case for making higher education more universal and more affordable. As the years went on, we pushed countless envelopes—Democracy has been at the center of the movement toward a new “middle-out” economic paradigm to replace supply-side economics, and we’ve promoted more esoteric ideas like pay-as-you-drive car insurance, now commonplace, and a taxpayer receipt adopted by the White House in 2011. Nick Hanauer and David Rolf’s “Shared Security system” is making policy waves today. The list goes on, and of course it must include the idea for a “Financial Product Safety Commission” unveiled in our pages by a then-little known Harvard law professor named Elizabeth Warren. Leafing—or clicking—through the pages of the past 40 issues, one is struck even more by the number of big, innovative, important ideas that have not come to pass—yet. For this was always the primary role of Democracy: to be the place that invests in ideas in their “seed stage”; to put forward the thinking that is just too original and even outlandish to see the light of day anywhere else; to push progressives to not only tinker with what is or to see down the road, but to look around the corner; and to debate what is the best path or the right priorities. This record of achievement is a testament to those who have made Democracy possible: America’s most prominent and pioneering writers and thinkers, the financial supporters who have so generously sustained us, the advisors who have guided our way, the interns who have stopped off to join us on their path to greatness, and the leadership of Michael Tomasky, E.J. Dionne Jr., and an amazing group of editors including Clay Risen, Ethan Porter, Elbert Ventura, Jack Meserve, and our newest editorial recruit whom we welcomed on board just last month, Sophia Crabbe-Field. However, this tenth anniversary is not as much an occasion to pat ourselves on the back as a call to push us forward faster. Two years into Democracy’s life, the conservative project collapsed along with the economy. That, combined with two wars of choice that were exacting a massive price, led the American people to turn to Barack Obama and the center-left for answers. Over the past eight years, much has been accomplished from saving the economy from collapse to passing universal health care, financial reform, pay equity, and other much-needed domestic reforms, to reasserting America’s global leadership. The list goes on and on. And without a doubt, if it were not for a recalcitrant Republican Party that refused repeatedly to find any common ground with the Administration, even more would have been accomplished. It is not enough for the next President Clinton (if there should be one) to be content to refine and extend the policies of President Obama. It is not enough for the next President Clinton (if there should be one) to be content to refine and extend the policies of President Obama. The challenges of today are too great, equaled only by the challenges we see down the road.The inequality gaps in income and wealth have grown to chasms, the middle class is shrinking, and the economic mobility that has powered America since its founding has stalled. New technologies have fragmented society even as they allow for new connections in a more diverse nation. America’s democratic institutions have become unresponsive and increasingly ineffective. As we look abroad, we need to confront global challenges to liberal values—be it from authoritarian regimes or radical terror groups—as well as the growing existential threat of climate change. The failure of the political system to tackle these issues has not gone unnoticed. Occupy Wall Street, Black Lives Matter, the Tea Party revolt, the strength of the Bernie Sanders candidacy, and the success of Donald Trump are all different manifestations of the deep belief that the promise of America is not delivering for all Americans. Thus, even if the election this November sees the elevation of another President Clinton, liberals and progressives should not respond with sanguinity. Instead, it is we who should be asking the tough questions, developing creative solutions, and wrestling with the challenges we see over the next five, ten, and 20 years. Raising the minimum wage, rebuilding twentieth-century labor unions, and shoring up creaky entitlement programs are necessary but not sufficient responses to the present challenges. Cold War institutions and managerial pragmatism abroad are insufficient to confront a world grappling with a warming planet, rising non-democratic powers, and lethal non-state actors.